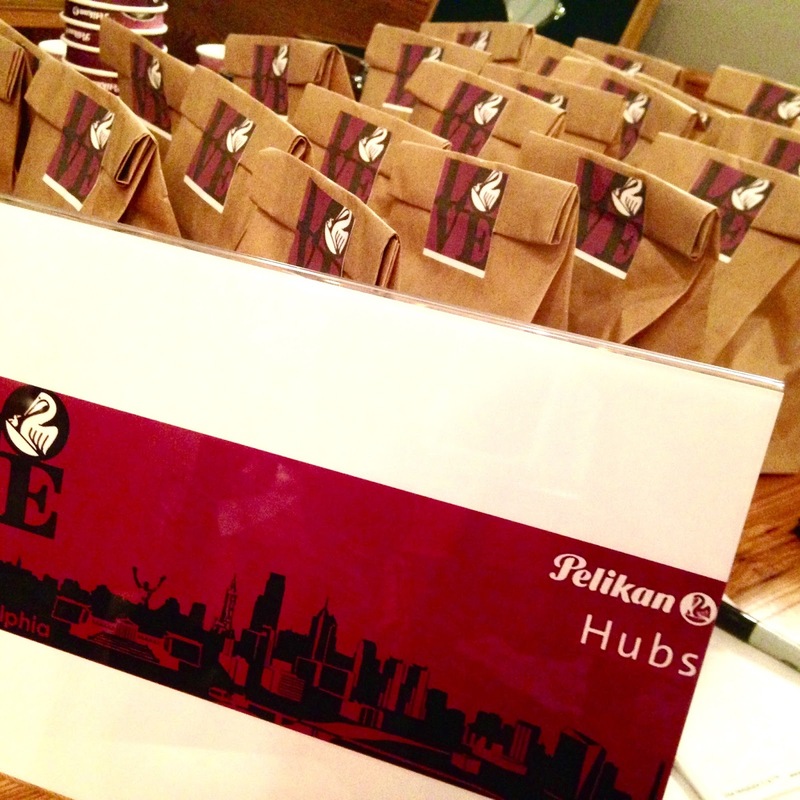 Last Friday, we were honored to participate in Pelikan Hubs, a worldwide event that gathered pen enthusiasts from all over the globe to celebrate the revered Pelikan brand. At 6:30p local time, registered pen addicts congregated to their respective meetup locations in major metropolitan areas like New York City, Philadelphia, Seattle, San Francisco, Madrid, Toronto and beyond. Sal & Tom, along with a few members of our NJ Pen Club, attended the Philly meetup, which was shepherded by flock-master Joshua of Pelikan's Perch. 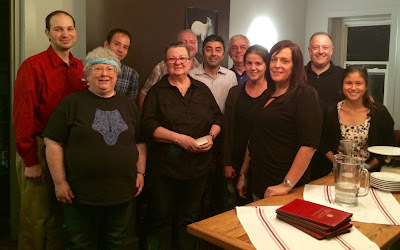 So, what do you do when you get a bunch of fountain pen fanatics in a room together? For those who have never attended a pen meetup or pen club meeting, here are 3 takeaways for people who love fine writing. One of the necessities of a pen club meeting is that attendees bring some pens to show off. At the Hubs meeting, Joshua brought his entire flock of Pelikans, including virtually every tradition series 200/205 model that has ever been produced. Now, I know what you're thinking and, no, you don't need to bring 100 pens to a meetup. A few favorite pens in your everyday carry would suffice. The point of bringing your pens is that everyone at the meeting can see, touch and (sometimes) write with pens that they wouldn't normally experience. With fountain pen brick-and-mortar retail stores so few and far between, it's rare to be in the presence of so many different writing instruments. Think of it like window shopping at a pen store without the pressure to buy anything. 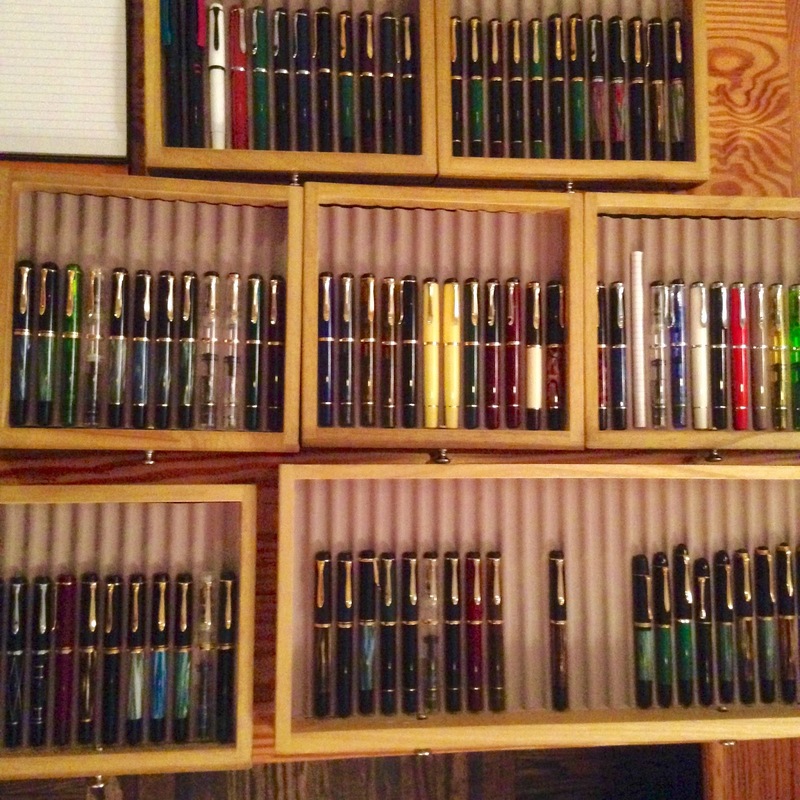 At Friday's meetup, James spotted a Pelikan M1000 in Joshua's collection. He never experienced holding the largest of the Souveran fountain pens and was quite taken by its huge 18ct gold nib and stately size of this fountain pen. I think it shot up to the top of his wish list after he receives the Nakaya he's been patiently waiting for. Writing with other people's pens can be a sensitive topic at pen meets. Fountain pens nibs are delicate and, if someone writes with a heavy hand or at an incorrect angle, a nib could be taken out of alignment and cause its owner quite a bit of grief. It is always appropriate to ask the pen's owner if they mind you writing with their pen. 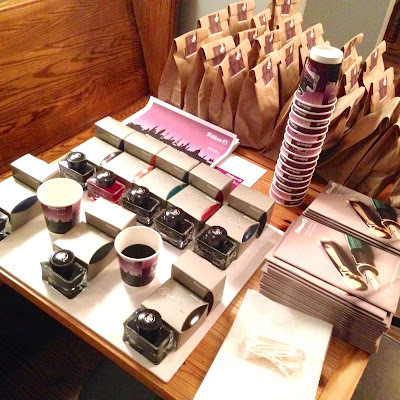 Goldspot brought the M600 Pink, M805 Demonstrator, M805 Stresemann, M205 Amethyst and Stola III to the meet. These are all the new Pelikan designs that were produced in 2015. With an ever-growing number of varieties being brewed in the US and beyond, ink has become a big topic of discussion. Besides finding the perfect hue, pen lovers are concerned with other ink properties like shading, sheen, shimmer, lightfastness, water resistance and ease of maintenance. Attending a pen meet affords the opportunity to try new inks. Most attendees will either bring ink samples, bottles or have inks loaded in pens to try. At Friday's Hubs meetup, Pelikan generously provided the entire selection of Edelstein ink bottles for attendees to sample and swab. At $30 a bottle, these inks would normally be quite expensive to sample. However, at a pen meet, anyone can write, scribble and swab to see, in person, if the color is going to be a new favorite or a fizzle. Be sure to bring a pad of paper you would normally use for writing so you can test out several inks. If the meet is expected to have several bottles of ink to try on-hand, you may want to have a few empty pens to fill up. A cup of water, paper towels and q-tip cotton swabs are also recommended to help with keeping your pen, and the meeting venue, clean. Arguably the most valuable part of getting together for a pen meet, aside from the socialization, is the free exchange of knowledge. People who are new to fountain pens, or pen collecting, can benefit greatly from the experience of others. From routine maintenance tips to adjusting nibs, open discussions at pen meetings are a treasure trove of information that help you be a better pen enthusiast. Friday night, Karen brought a couple of Pelikan pens she owned for some years, but was unsure about the specific model. After a minute with Joshua, she knew exactly which models she had (M250's) and a brief history of their creation (they were created exclusively for the retailer Levenger). Pen aficionados can talk about their inks much like beer & wine connoisseurs discuss craft brews and varietals. Besides reading online reviews, pen meetups offer real viewpoints about which inks are safe and fun to use. Ultimately, a pen meet is about providing a real life experience that doesn't exist in online forums or in brick-and-mortar retailers. Instead of clicking on links and looking at handwriting sample scans, a meetup gives you the opportunity to sample the ink in person, hold the pen in your hand and receive honest, face-to-face advice. Are you interested in participating in a pen club near you? Check to see if there is one in your area by logging into Fountain Pen Network or the FP Geeks forum to find if a local group is meeting. If you're in the NJ tri-state area, the recently-formed NJ Pen Club has a few meetings under our belt since June. If you're interested in joining our club and would like to attend a future meeting, please feel free to leave a comment with your e-mail, twittter handle or FPN screen name and we will add you to our pen club e-mail notification list.